Editor's note: Frolic is 5 years old! We're reprising some of our all-time top posts this month, February 2019. Here's one from November 2014. Oh, how times have changed. Several years ago, I did a piece for Metromix Honolulu on my top 10 manapua spots, and to my surprise, people out there have some very strong opinions on what is best. 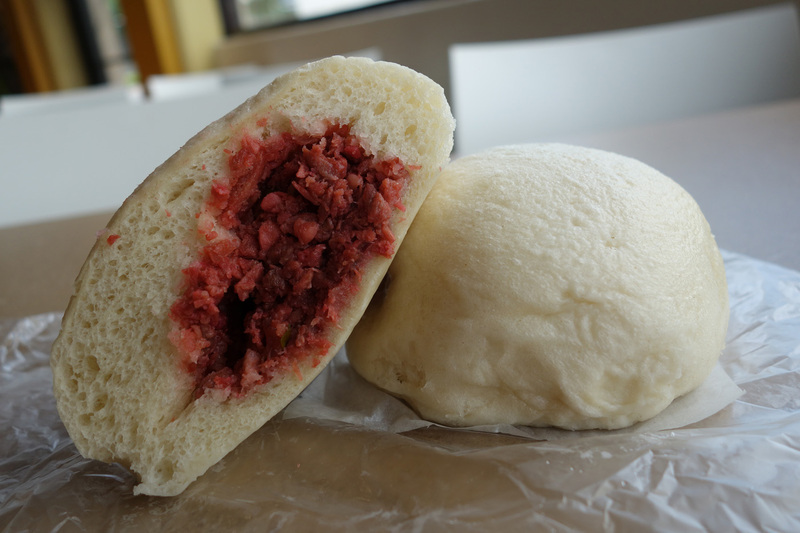 I decided to revisit the manapua shops in town — not to mention, a few more have opened since then — and condense it down to my top five. I thought this would be an easy task and I’d end up ranking the top five of 10 from my last list. I also thought this would be a cheap adventure. I have to say, I was pretty disappointed in what I found. Quality at most places had diminished, and, worse yet, prices had gone up dramatically. The most expensive char siu bao was a whopping $1.89, and the cheapest was $1.40. Outrageous! Who’s the bigger Chinese: You manapua makers, for charging so much? Or me, for balking at the prices? After several days of research and grumbling, I pulled a list together. I only compared char siu baos to ensure I was comparing apples to apples; I couldn’t limit it to preparation because Char Hung Sut only does steamed and Royal Kitchen only does baked. I did, however, pass judgement for price-to-value ratio, which changed up the list quite a bit. I like that the filling and the bread in Libby's Manapua are soft and pillowy. There wasn't as much flavor as I remember, but enough to push them into my top five list. Their bao are $1.60, which is a mid-range price these days. I've been a critic of Char Hung Sut's bread-to-filling ratio since I was a kid, but every time I show someone this photo, they gasp. I get that the meat is salty (which I love) and needs bread to even out the flavor. And the bread is good. I did have to mark off points for being $1.70, though. Last time around, I criticized Chun Wah Kam for using a lot of red dye on their pork. Now, they have scaled back on the dye, which hasn't affected the flavor. I like that there is a more generous bun-to-meat ratio, too. The bao isn't cheap, though: It is one of the more expensive ones at $1.89 a pop. Royal Kitchen is a classic favorite, since the pork is nicely salty-sweet and the bread is soft and sweet. However, the air pocket is always a big disappointment, as you can see. The bao is also smaller than all the others. They get points for being the cheapest, too, at $1.40 each. I surprised myself when I tallied the scores and Sing Cheong Yuan came out on top. They didn't make the list last time, but since then, Mei Fang has improved the recipes on all of their dim sum. I was a little alarmed at the amount of red dye used, but the flavor of the bun and the filling were very good. (My partner Russ Sumida once inhaled this bao, even though he was full from lunch, because he could smell it.) At $1.60 each, these are also average on pricing. So there you have it. Next time someone brings bao to a meeting or a potluck, thank them wholeheartedly — that box cost them a lot! By the way, if your favorite manapua shop isn’t on this list, it’s possible that someone MAY have done something very unsanitary in front of me. Just saying.